Bianca Devlin ‘s life is all work and no play as a disaster relief worker, but it figures that the one time she’s forced to take a vacation, she gets kidnapped by guerillas when she steps in to prevent them from taking a diplomat’s son. 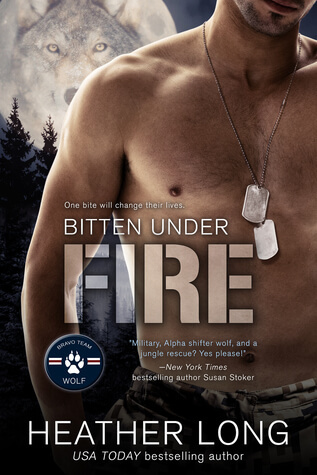 I was completely blown away by the first book in this series and expected BITTEN UNDER FIRE to be similar, so I was somewhat disappointed when I didn’t get any of the action and suspense I was expecting. But this book ended up being fun in its own way. Bianca is independent, strong and enjoys a life with no fuss, but her attraction to Cage is reason to slow down and enjoy a slower pace and an unexpected romance. However, romance may not be the only change she is facing and she’ll need every bit of fortitude she’s built to face an uncertain future, which may or may not have Cage in it.